Approved for Ryanair, EasyJet, British Airways and many more. Comfortable Lightweight material with adjustable padded shoulder straps and side compression straps for increased comfort. Aerolite Max backpack maximises your cabin luggage allowance! With an impressive capacity of 40L within it’s compact 55x40x20cm frame. Aerolite provides a quality travel backpack designed to suit your travel needs. The spacious carry on keeps your hands free and provides a large interior perfect for trips away. Aerolite Max has internal pockets that are perfect for essential items – passport, flight tickets, money, chargers, and phone. 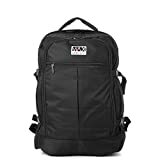 This entry was posted in Luggage and tagged 55x40x20cm, Aerolite, Approved, Backpack, Black, Cabin, Hand, LUGGAGE/CARRY, Ryanair by Perfect Vacation. Bookmark the permalink.